Why Does My Bike Look Like an Airplane? The simple answer is Aerodynamics, which is the thing that makes you faster without requiring you to work harder. The complex answer is marketing, of which I don’t pretend to know anything about. So here is a brief introduction to Aerodynamics, from someone who has had a full two semesters of fluid mechanics classes. Aerodynamics is a section of fluid mechanics concerned with the flow of air. Virtually anything that consists of small particles that are not attached to each other can be considered a fluid, even something like dirt or glass. Anyway fluid mechanics was studied by a bunch of really smart people who are all dead now. 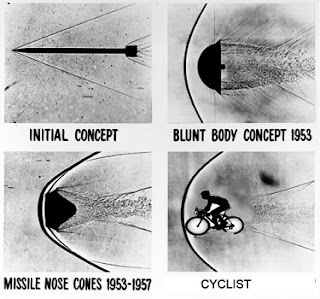 They mostly studied incompressible flow, which is flow that travels at speeds no where close to the speed of sound(most cyclists would fall into this category). Incompressible flow has been well understood for at least fifty years (yup it was a full half century before any bicycle designer ever saw an airplane, old Italian guys don’t get out much). There are two basic types of Incompressible. Laminar and Turbulent. A Laminar flow is a really simple flow where the particles all go in pretty much the same direction, like when you turn on a faucet and it looks really smooth and you can see through it. The water flow coming out of the faucet would be said to be Laminar. Laminar flow is really nice and simple, because it can be modeled using math…my favorite subject (it’s so interesting). Unfortunately, in the real world there is very little laminar flow. Instead almost everything is Turbulent, which is like when you turn the faucet on all the way and it’s all white and bubbly. No one really understands how turbulent flows work because there’s all sorts of instabilities, boundary layers, and other weird things that go on. Einstein said he never fully grasped fluid mechanics; I’m almost certain I’m no Einstein which gives me ample justification for getting bad grades in my Fluids classes. So at some point in the past ten years bike designers thought it would be a good idea to turn your down tube into an airplane wing. This is because the airplane wing generates far less drag than a circular tube. How much? If you had a one inch tube and wanted to generate as much drag with an airfoil section, the airfoil would have to be ten inches wide. But this is about as far as math would take bicycle aerodynamics. Because the bike is a very complex structure with lots of parts moving different directions, almost all the flow over a bike is turbulent. 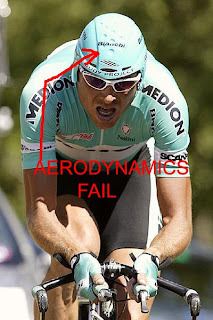 But thanks, to the miracle of computers there is a way to almost predict how aerodynamic forces will act on a bike. It is called Computational Fluid Dynamics (CFD), which breaks up the airflow into a bunch of tiny pieces and uses a lot of assumptions and math to figure out how each small particle affects the particles next to it. CFD is far from perfect but gets pretty close. CFD computer programs are very expensive, so most bike designers opt for the cheaper method. 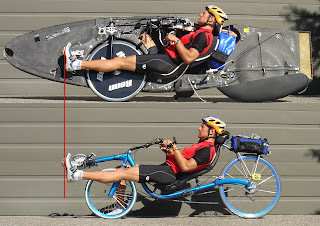 Instead they try turning different parts of the bike, the fork, tubes, seat post or spokes into tiny airplane wings and then sticking the bike into a wind tunnel (or not) and seeing if anything changes. 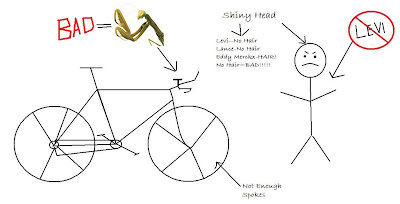 And that’s how it all works in the world in bicycle aerodynamics. 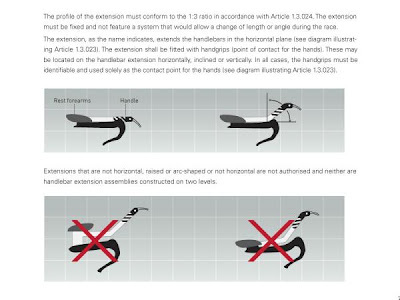 I’m a bit of a traditionalist, and am thankful that the cycling world is slow to embrace science. If they did we’d all be riding something like this: Ugh, the mere thought sends chills down my spine. Now that I’ve demystified bicycle aerodynamics I can finally make the blog post I’ve always wanted: Dimples are Gimmicks (Looking at you Zipp). If it isn’t apparent I enjoy devaluing new bike technology.